Two weeks of 3rd year have already flown by and I have been so busy that I haven’t had time to write a proper post. I’ve started several drafts but ran out of time (I do have to sleep sometimes…and go to class!). As time has gone on, there have been more and more experiences to write about and I’ve honestly been getting a little overwhelmed with just how much there is to document. To break the ice, here is a mini post. I’ll return with a more detailed one once I’ve earned a good study break. Today was a long day – like they all are. We were supposed to start the day with a lecture on auscultation in Internal Medicine, but the lecturer never showed. It might have not been as irritating if it hadn’t been an 8:00 am class and located on the Buda side, meaning we have to leave a full 40 minutes early to get there on-time. We left after waiting for 25 minutes and made the trek back down to our next class, loacted near the Corvin metro stop. With an hour or more to kill, we enjoyed coffee with a small group of friends at Tejivó. After a patho-histology practical, immunology lecture and amazing first lecture in our elective Social Media in Medicine (a one of a kind course! ), we were finally on our way home to… study! Skjalg actually left for a crossfit class, while I sat down to work on a presentation I’m supposed to give tomorrow on auscultation of the heart. Since our lecturer didn’t show up this morning, I have to get my material from youtube and our textbook. Hope I get it right! I’ve completely converted to taking my notes on my iPad, using a note taking program called Notability. It’s taking some time to get used to it, but it is going to save me a lot of time, patience and money in the future – no more daily visits to the print shop for me! 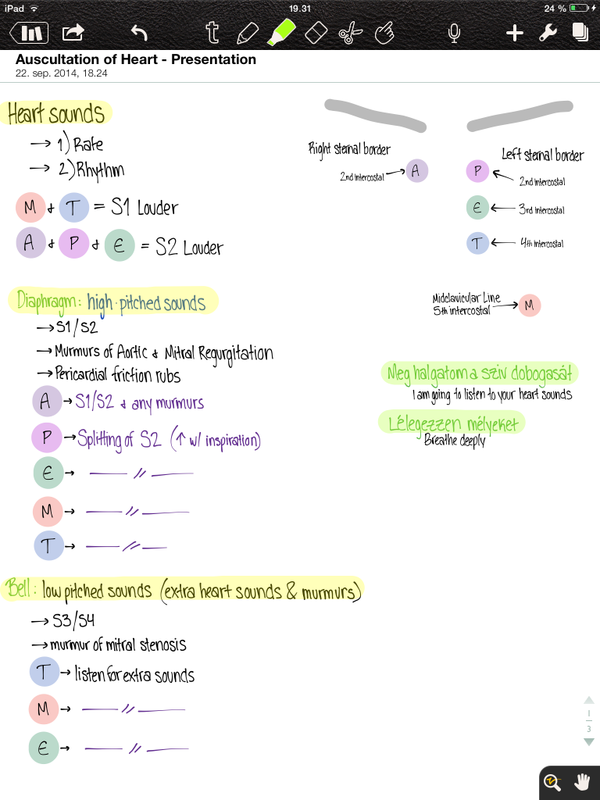 Your notability notes are just as lovely as your handwritten ones! You are currently reading As the days fly by at Buda-B.